After a strong start to the year, national employment growth ground to a halt in March. While there was no significant deterioration compared to February, there was little overall change in any major labour market indicator. All told, Canada lost 7,200 net jobs last month. That number is essentially a rounding error for an economy that employs 18.9 million people across the country. It also comes after two consecutive months of solid jobs gains; the Canadian economy added 122,600 net new jobs in January and February. 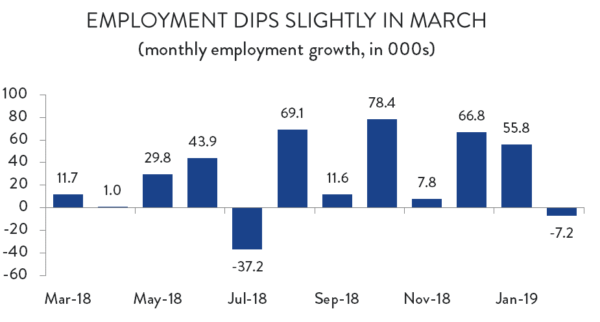 As a result, first quarter employment growth for 2019 came in at a relatively strong 1.8 per cent – its best quarterly performance since the end of 2017. With employment effectively unchanged compared to February, there was little movement in any other major labour market indicator either. The unemployment rate remained at 5.8 per cent. Labour force participation dipped from 65.8 per cent to 65.7 per cent; and the employment rate (the share of working-age Canadians with a job) also dropped by just one tenth of a percentage point to 61.9 per cent. Neither was there much change in job type. There were 6,400 fewer full-time jobs across Canada in March – a decline of just 0.04 per cent – and 900 fewer part-time jobs (a 0.03 per cent decline). While there was no appreciable change in overall employment, tight labour markets are continuing to put upward pressure on wages. 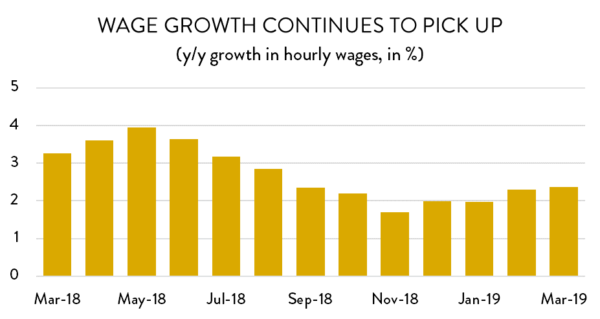 Year-over-year wage growth has been accelerating since November; in March, average hourly earnings across Canada were 2.4 per cent higher than they were at the same time last year. The strongest wage growth across the country was in Newfoundland and Labrador, as well as in Quebec. The slowest growth was in Nova Scotia and BC. Employment growth was mixed across Canada in March. Four provinces posted gains, four losses, and two effectively unchanged. In terms of overall job creation BC led the way, adding 7,900 net new jobs last month – an increase of 0.3 per cent compared to February. BC has seen five consecutive months of job growth, adding 37,200 positions over that period. Saskatchewan and New Brunswick also posted solid gains (3,900 and 3,100 net new jobs, respectively), while PEI recorded the largest percentage increase in employment – 2.0 per cent. Those gains were largely offset by job losses in central Canada. Quebec gave back most of February’s employment growth, shedding 12,900 jobs. Meanwhile, there were 8,800 fewer jobs in Ontario. In Ontario’s case, that decrease represents just a small fraction of the 78,300 new jobs created in the province since December. Alberta and Newfoundland and Labrador also posted job losses in March. At the industry level, employment was relatively flat in the goods sector, with the exception of manufacturing, which posted reasonably solid gains. Goods-producing industries added 1,600 jobs in March – an increase of 0.04 per cent. 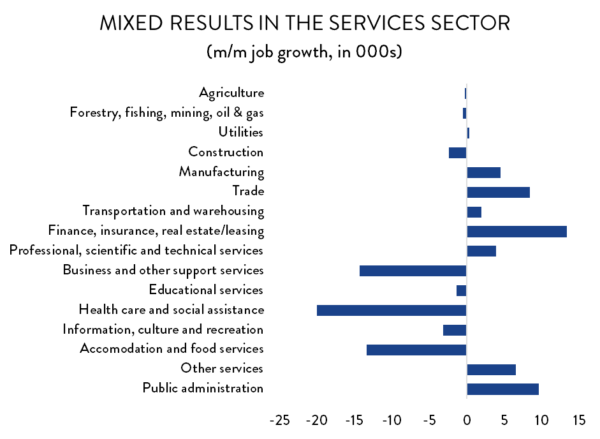 Results were widely mixed in the services sector, however. While there were 8,800 fewer services sector jobs in total, there were significant gains and losses within specific industries. On the positive side, there was strong growth in finance, insurance, real estate and leasing (13,300 net new jobs), as well as wholesale/retail trade (8,400 jobs) and the public services (9,600 jobs). However, those gains were more than offset by losses in health care and social services (20,000 jobs), business and support services (14,300 jobs), and accommodation and food services (13,400 jobs). 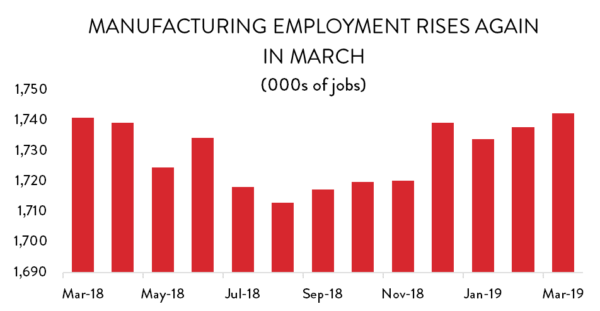 Manufacturing employment was up for the second month in a row in March, adding 4,500 net new jobs and building on the 4,000 positions created in February. With 1.74 million Canadians now working in the sector, manufacturing employment is sitting at its highest level in more than a year. As a result, labour markets in the sector remain extraordinarily tight. The unemployment rate in manufacturing remained unchanged at 3.2 per cent in March – well below the national average rate of 5.8 per cent. As noted last month, tight labour markets in manufacturing are resulting in significant wage pressures in the sector. For the second month in a row, year-over-year wage growth topped 5.0 per cent – more than twice the national average rate of 2.4 per cent. 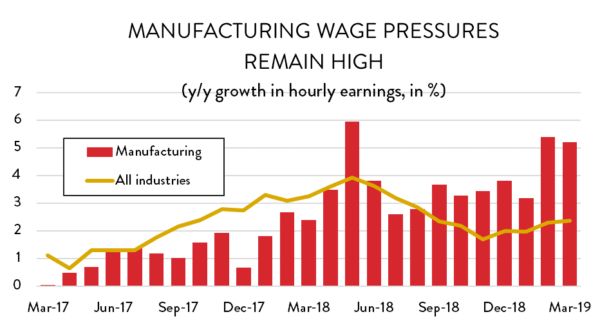 Wage pressured are especially acute in PEI and Saskatchewan, where hourly earnings in manufacturing are seeing double-digit growth compared to last year. 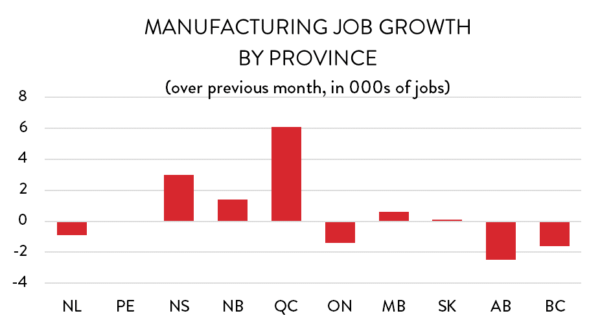 For the second month in a row, manufacturing job gains were largely concentrated in Quebec. The province added 6,100 new manufacturing jobs, building on the 1,900 positions created in February. Quebec has added 17,900 manufacturing jobs since October and sectoral employment is at its highest level since last January. On a percentage-growth basis, however, the largest increases were in Nova Scotia and New Brunswick. Manufacturing employment in Nova Scotia jumped by 9.4 per cent (3,000 new jobs), while New Brunswick saw a 4.5 per cent increase (1,400 new positions). Employment was also higher in Manitoba and Saskatchewan. On the negative side, manufacturing employment was down considerably in Newfoundland and Labrador, as well as in BC and Alberta. 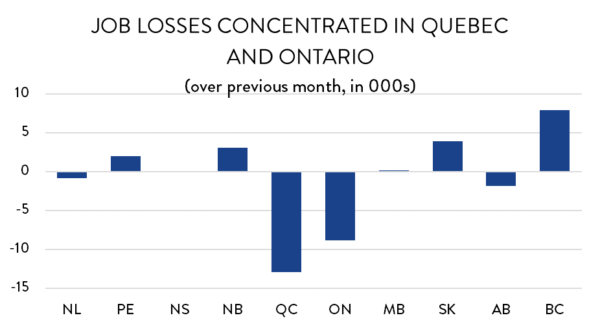 While losses in Newfoundland and Alberta reflect a climbdown from spikes in February, BC’s job losses represent the continuation of a steady negative trend that has lasted a full year. BC has lost 11,300 manufacturing jobs over the last 12 months.